College. Community. Christ. These three words describe the vision and reality for the entire Bourgade Catholic High School community. They are the motivation for our Advancement Office which is dedicated to building relationships that help market Bourgade Catholic and augment its operating budget. Your donation to our fundraising campaigns, tax credit opportunities, and memorial scholarships are critical to our efforts to provide the resources that promote the growth of Bourgade Catholic High School. The Bishop Bourgade Annual Fund serves as a pillar for Bourgade Catholic High School. This annual fund provides a financial support system for all the costs that fall under operating and maintaining the school. These costs range from facility maintenance to supplementing internal financial aid for the families that attend BCHS. The Bishop Bourgade Annual Fund carries a strong tradition and is supported by much of our community. With the funds that are contributed annually, we are able obtain and maintain the resources needed to continue providing a premiere Catholic education for the hundreds of students that grace our campus. To contribute to the Bishop Bourgade Annual Fund, please click the button below. Thank you in all your support. ​https://catholiceducationarizona.org/ or contact Mrs. Sue Rounds at srounds@bourgadecatholic.org. The Adopt-a-Student Program is designed to provide a college preparatory, faith based education to students with financial obstacles that prevent them from attending Bourgade Catholic. We ask members of the Bourgade Catholic High School community, local businesses and friends of BCHS to make a financial commitment to supporting a Bourgade Catholic student, ideally for 4 years. A number of donations to the Adopt a Student Program are made yearly to go to the most-needy student or are made in memory of a former Bourgade Catholic faculty member, administrator or student. And the desire to continue their education on a college level. Peter van Leeuwen touched the hearts of many people during his short years on earth as an altar boy and active parishioner at St. Jerome’s parish, a classmate and friend to all at Bourgade Catholic High School, an Honor student and Valedictorian of the Class of 1984 and as a National Merit Scholarship while attending Arizona State University. An endowment was started in 1994 in memory of Peter and funds an annual scholarship to a student at Bourgade Catholic who characterizes the same academic excellence that Peter did. To donate, click the image to the left. 2017 Peter Van Leeuwen Scholarship winners (Lauren Kuhman and Catherine Torrie) . 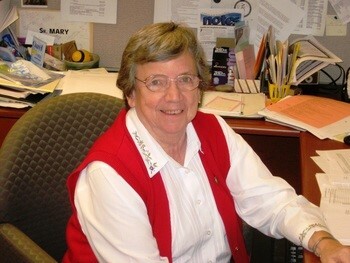 ​During Mary Palsma’s 28 year career at Bourgade Catholic, she taught every math class that was offered, from pre-Algebra to Calculus, plus did a stint as the typing teacher and honorary football coach. Early in her career at Bourgade Catholic she came to realize that she was not just a classroom teacher but rather a Catholic School Educator. Mrs. Palsma remained a loyal advocate for Bourgade Catholic even after retirement serving on the Annual Campaign Committee, 50th Anniversary Committee and as a member of the Hall of Fame. The Class of 1977 Legacy Scholarship is in memory of the deceased members of their class. The 1977 Legacy Fund will benefit to distinct groups. Contributions can be designated to provide financial assistance to a relative of a member of the Class of 1977 or to provide for an item from the Faculty/Staff Wish List. Class members believe they received an excellent education and Bourgade Catholic and wish to make that same experience available for others. ​The Class of 1979 Legacy Fund was established in memory of the deceased members of their class. This Fund will provide tuition assistance to a current or incoming Bourgade Catholic students that is related to a BC alumni. The Bourgade Catholic High School Class of 1966 Scholarship, was established by the first graduating class of Bourgade Catholic High School to honor their classmates. This $1,000 scholarship will be awarded once per year and is a one time only award. Be a graduating senior in the class of 2018. Not be related to anyone on the BCHS staff. Be in good academic standing with a minimum cumulative grade point average of 2.5 based on a 4.0 scale. Plan to enroll as a full time undergraduate at an institute of higher learning for the fall of 2018. Have not received any other scholarship or grant money to attend college in the fall. and to walk humbly with your God." The Andrew Bunikis Memorial Scholarship was established in 2008 to commemorate Andrew’s outstanding commitment to service demonstrated during his years at St. Jerome and Bourgade Catholic. The spirit of the Andrew Bunikis Memorial Scholarship is centered on an individual’s commitment to service and community involvement.